The Employee Mobility Institute ( TEMI ) is committed to supporting Global Workforce Management practitioners in developing their knowledge and skills. We believe that continuing professional development (CPD) activities allow those working in our industry the ability to retain and develop their expertise. Our aim is to support, facilitate and promote a professional development program for our community. 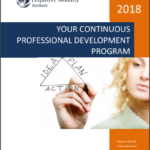 TEMI believes that continuous professional development is a core personal responsibility of all professionals. We recommend you complete at least 20 hours of CPD activities per annum in order to keep your knowledge and skills current. The Spotlight Series is made up of short learning programs designed to keep you up to date on core components within the Global Workforce Management Industry. You’ll gain a deeper understanding of current practices within a range of industry disciplines. By focusing on specific training necessary to support a global workforce, the Spotlight Series will inform you of contemporary processes and crucial emerging developments. Earn your GMP1® Global Mobility Professional Designation today. The GMP1® training program comprises 4 stand-alone comprehensive units designed to broaden your capabilities across the spectrum of global mobility disciplines. Written by well respected Global Workforce Management professionals, this program combines both strategic and operational element required to effectively deliver a global Talent Mobility program. Do you have a business issue that requires buy in from multiple stakeholders? Want to improve your in-house team’s Global Workforce Management capabilities, increase performance and improve employee engagement. If so, consider the TEMI in-house team training solutions. This is a powerful way to align training content and team learnings to meet your specific organisational needs, improve team performance and realise a greater return on investment. Providing Talent Mobility Leaders the opportunity to come together regularly in small groups, to discuss challenges, get answers to those burning questions, brainstorm strategies, discuss industry trends and share experiences – all in a private, collaborative peer to peer environment. This is your opportunity to grow your professional network, work collaboratively with your peers in a boardroom environment to discuss and explore ways to overcome the challenges keeping you awake.